You guys, I would last approximately six minutes on a low-carb diet. How do I know this? Because I’ve tried, and I lasted approximately six minutes before I dove face first into a bread basket. No, really it might have been 1.5 days. I tend to try out all ways of eating at least for a little bit so that when my nutrition clients ask me what I think I can give the most informed answer possible. I also like that it affords me some empathy and understanding when people need to or want to eat in a certain way. But I tell ya, I do not feel good when I cut out carbs. If you feel best when you eat low-carb or grain-free, power to ya. You do you. And I’ll be serving these Cheesy Baked Spaghetti Squash Noodles with a nice side of crusty bread. 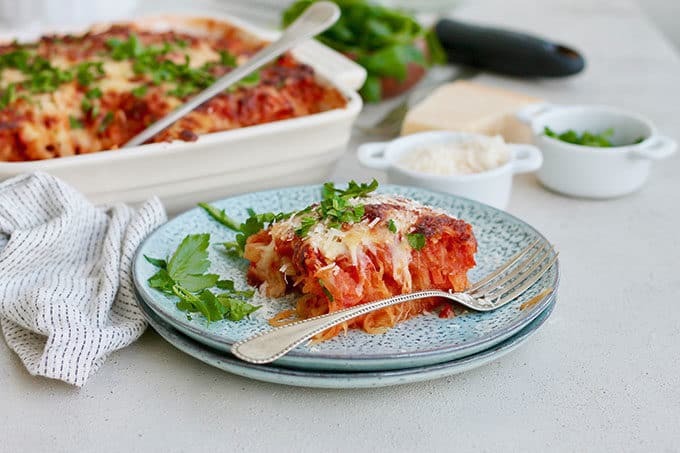 I like having an arsenal of low-carb recipes because a) people ask me for them, b) they make excellent side dishes, and c)I like listening to my body and honouring my cravings, and sometimes I crave a warm veggie-packed dish without the carbs. 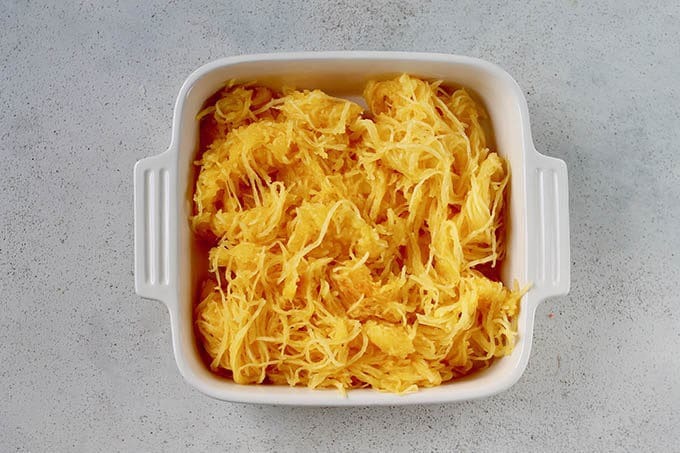 Before there were spiralizers and store-bought low-carb pasta, there was spaghetti squash. 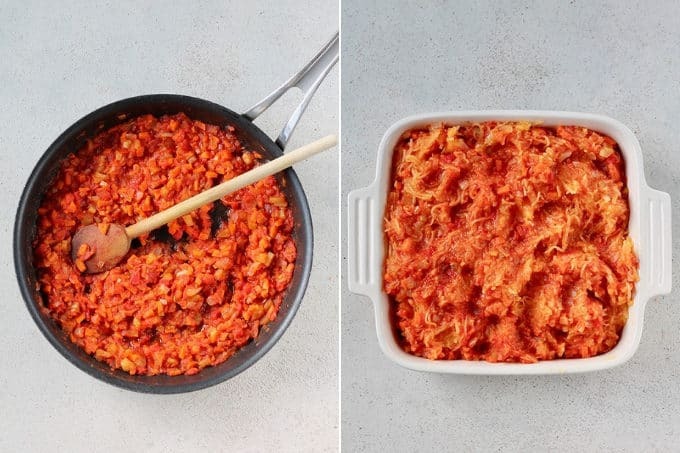 It’s the OG vegetable noodle, and it’s here to tell you it’d like to be baked up with a veggie-packed tomato sauce, smothered in cheese, and stuffed into your face like the delicious vegetarian comfort food it is. Let’s do this! What’s in Cheesy Baked Spaghetti Squash Noodles? Spaghetti Squash –> Boom! You’re looking for a three-ish pound squash here. Onions and garlic –> The flavour makers. Celery and carrots –> Support crew! Crushed tomatoes –> To make the situation saucy. White wine or vermouth –> Just trust me on this one. CHEESE! 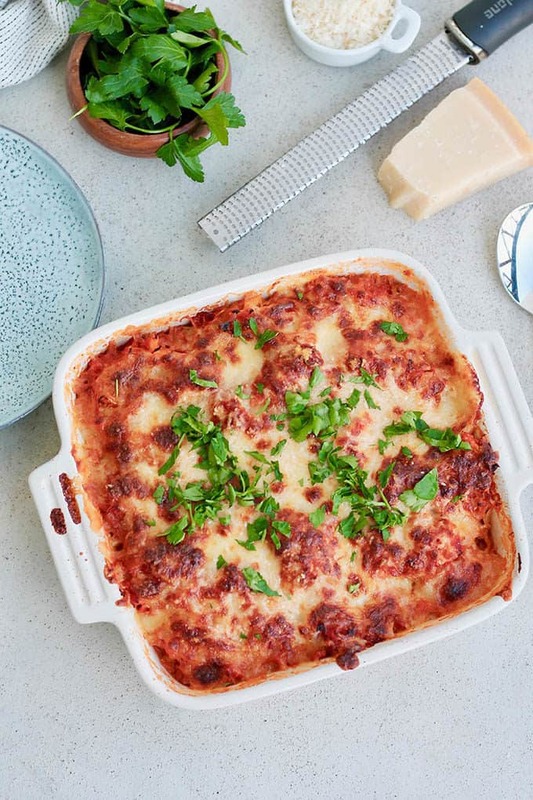 –> We’re going in heavy-handed with mozzarella and Parmesan. How do you cook spaghetti squash noodles? Brace yourself, folks. I cook my spaghetti squash in the microwave. Trust me on this one, it’s the easiest way to cook a super-hard squash like spaghetti squash. You just stab the squash a bunch of times with a sharp-tipped knife, put it on a microwave-safe plate, and zap it for 12-ish minutes. I like to check on it / rotate it every 3 minutes so that a) it doesn’t explode, and b) I don’t overcook it. Remember that these spaghetti squash noodles are getting baked in the oven, so we’re going for an al dente situation here. Your spaghetti squash is done when it feels slightly soft when you squeeze it, or when a sharp-tipped knife pierces the flesh with relative ease. Take it out of the microwave, let it cool down for 10 mins or so, then slice in half, scoop the seeds out, and use a fork to scrape the noodly flesh out into a bowl. No microwave / freaked out by microwave cookery? No problem! You can throw your whole spaghetti squash into the oven at 350 and roast it until soft. This will take considerably longer – 30-40 minutes in the oven at 350°F. Then let it cool down and proceed as above with your seed-scooping and fork-scraping. While your spaghetti squash is cooking / cooling, get to work on your pasta sauce! Start by sautéing your onions on a medium heat until they turn a nice golden brown colour. We’re going for deep flavour here, so don’t rush this. Add in the garlic, carrots, and celery, and cook until the vegetable are soft. Then add your white wine or vermouth. This will pick up all that great flavour from the bottom of your pan, and make your baked spaghetti squash noodles freaking delicious. Add the crushed tomatoes, and season with salt and pepper. 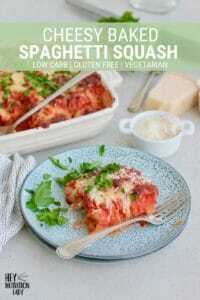 Combine the sauce with the spaghetti squash noodles, and transfer everything into a casserole dish. Bake this stuff for 30 minutes, until the sauce is bubbling up around the edges. Remove from the oven and add your cheese! Then return to the oven and bake for an additional 15 minutes, until the cheese is brown and bubbly on top. Now get this stuff into your face! You’re aiming for teeny tiny finely diced vegetables in this dish. Feel free to shred them or do the chopping in your food processor to save time. While this recipe calls for white wine, I seldom have white wine kicking around in the colder months, but I always have a bottle of white vermouth in the liquor cabinet and use them interchangeably for cooking. A bottle of vermouth will last forever, so it’s a great choice for a cooking wine. Can I use another kind of squash in this recipe? Spaghetti squash is the only squash (that I know of) with the kind of stringy flesh we’re after here. 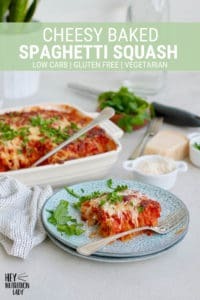 Can you substitute spaghetti squash for pasta? That’s kind of the point here. 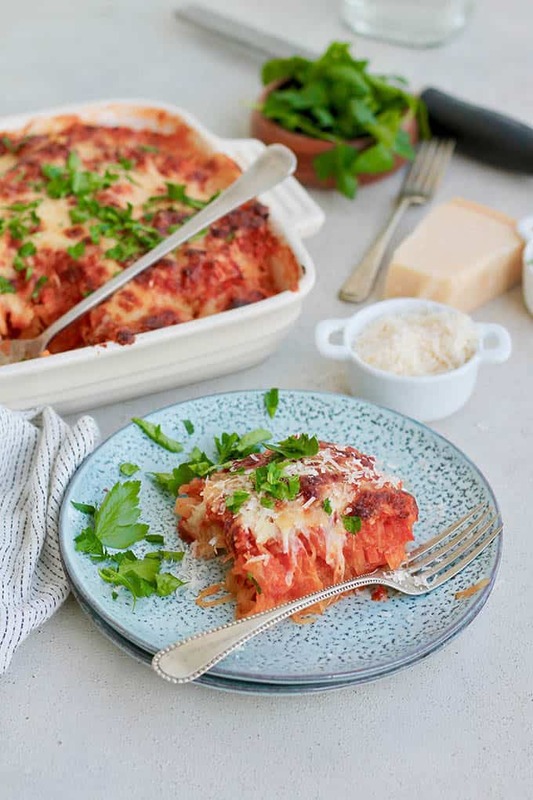 It’s a no-noodle lasagna kind of situation. Can this recipe be made vegan? If you leave the cheese off or substitute a vegan cheese that melts well, then yes. Can I make this recipe in advance? You sure can! You can prepare everything in advance and leave it in the refrigerator until you’re ready to bake it. Tip! Cook the spaghetti squash ahead of time and this recipe will come together quickly. Can I freeze this recipe? To be honest, I don’t love this recipe frozen and re-heated. I recommend you keep the leftovers in the fridge and eat them up within 3-4 days. Yes it is, my friends. Spaghetti squash, and other yellow-fleshed winter squash are rich in carotenoids, a precursor to vitamin A, and are a good source of vitamin C. Spaghetti squash is also a very good source of dietary fiber, with about 25% of the recommended daily intake in a one-cup serving. Although winter squash is quite high in carbohydrates (about 18g per cup of cooked squash) it is also classified as a low glycemic-index vegetable, as it has been shown to lessen our glycemic response to meals and help moderate the release of sugar in the digestive tract. Cheesy Baked Spaghetti Squash Noodles is a healthy vegetarian low-carb meal you're going to fall in love with! Packed with veggies, this oven-baked casserole is easy to make and delicious to eat. Pierce your spaghetti squash several times with the tip of a sharp knife. 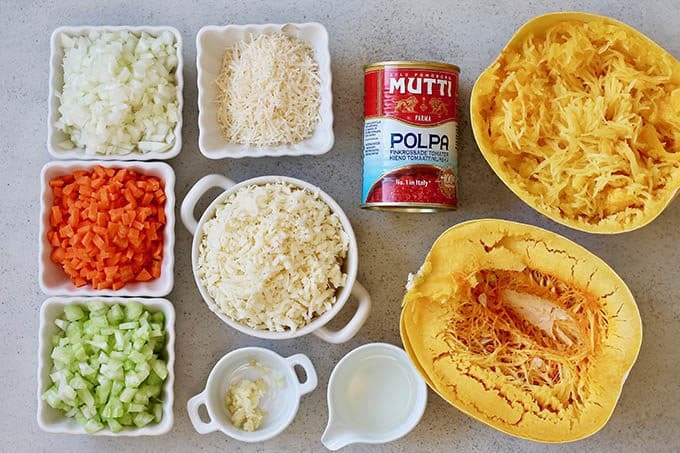 Place the spaghetti squash on a microwave-proof plate, and microwave on high for 12 minutes, stopping to check on and rotate the squash every three minutes. Remove the squash from the microwave and let it cool until you're able to handle it comfortably. Slice the squash in half, and use a spoon to remove the seeds. Use a fork to shred the spaghetti squash flesh into "noodles" and transfer the noodles into a bowl. Preheat your oven to 350°F / 180°C at this point. Heat the olive oil over medium heat in a large heavy-bottomed skillet. Add the onion, and cook, stirring often, until it is well-browned - about 10-15 minutes. Add the garlic, celery, and carrots, and cook for about 5 minutes more, until the vegetables are softened. Add the white wine and stir the contents of the pan well to lift the flavour from the bottom. Allow the wine to evaporate almost entirely. Add the crushed tomatoes, and stir to combine well. Season with salt and pepper. Add the tomato sauce to the spaghetti squash noodles, and stir to combine well. Transfer to a 9x9 inch casserole dish. Place in the oven, and bake for 30 minutes. The sauce should be bubbling up around the sides at this point. Remove the casserole dish from the oven and scatter the cheeses over the top. Return to the oven and bake for an additional 15 minutes, until the cheese is browned and bubbly on top. You're aiming for teeny tiny finely diced vegetables in this dish. Feel free to shred them or do the chopping in your food processor to save time. While this recipe calls for white wine, I seldom have white wine kicking around in the colder months, but I always have a bottle of white vermouth in the liquor cabinet and use them interchangeably for cooking. 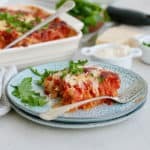 Can I make this recipe in advance? You sure can! You can prepare everything in advance and leave it in the refrigerator until you're ready to bake it. Can I freeze this recipe? To be honest, I don't love this recipe frozen and re-heated. I recommend you keep the leftovers in the fridge and eat them up within 3-4 days.